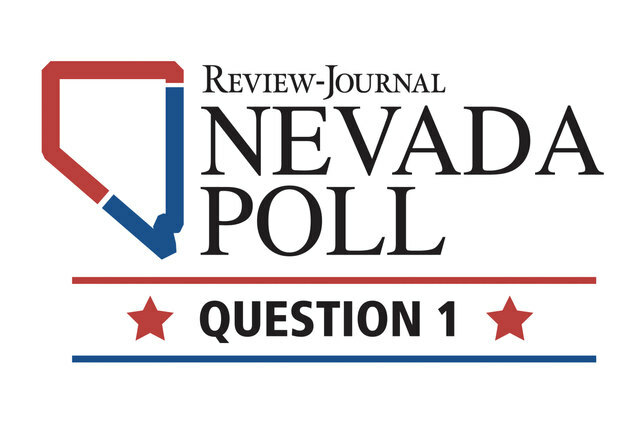 Nevadans strongly support Question 1, a ballot measure to expand background checks for firearms, according to a poll of 800 likely voters commissioned by the Las Vegas Review-Journal. Nevadans strongly support a ballot measure to expand background checks for firearms, according to a poll of 800 likely voters commissioned by the Las Vegas Review-Journal. Question 1 would expand the background checks to private-party sales and transfers. It would require both parties involved to appear before a federally licensed firearms dealer, who would conduct a background check on the person receiving the firearm. The measure is intended to close loopholes that allow felons, the mentally ill and those with a history of domestic abuse to obtain firearms. The measure, which is on the Nov. 8 general election ballot, would become law as soon as it passes. Fifty-eight percent of respondents supported the measure and 32 percent were opposed. Ten percent indicated they didn’t know or didn’t answer. Bendixen & Amandi International conducted the poll Sept. 27-29 in English and Spanish. It has a margin of error of plus or minus 3.5 percentage points. Among Republican likely voters, 39 percent supported the measure and 49 percent opposed it. The remaining 12 percent didn’t know or answer. “In this case, the Democrats are for it and the Republicans are kind of split, which means it’s going to pass unless the Republicans go against it,” said Anthony Williams, special projects director of the polling company. Seventy-three percent of Democratic voters polled supported the ballot measure. Among independent voters, 64 percent supported it. “The polling consistently shows strong support for common-sense measures like Question 1 because Nevadans know that background checks will save lives and make our state safer,” Question 1 Campaign Manager Joe Duffy said in a statement. Nevadans for Background Checks, the state political action committee leading the charge to get the ballot measure passed, reported receiving $1.29 million in contributions and spending $880,402 through June 9. Its next filing is due Oct. 18. The group has received much of its financial backing from Everytown for Gun Safety Action Fund, a national gun violence prevention group tied to former New York City mayor and billionaire Michael Bloomberg. Under the proposed measure, the first conviction of violating the law would make the person selling or transferring the firearm guilty of a gross misdemeanor, with a potential sentence of up to one year in jail, a fine of up to $1,000 or both. After the first conviction, an individual would face a class C felony, which carries between one and five years of prison time and a fine of up to $10,000. The National Rifle Association has opened a campaign field office in Las Vegas and is fighting to kill Question 1 through NRA Nevadans for Freedom. The organization believes that as more Nevadans are educated about what Question 1 will mean, more will reject it, spokeswoman Catherine Mortensen said. The organization’s efforts to sway voters include door knocks, phone calls, yard signs and television ads. One voter who hasn’t made up his mind yet is Paul Thompson, a retired 78-year-old teacher in Las Vegas. He said he’s not opposed to the principle of background checks if the practice hurts illegal gun sales, though he doesn’t believe background checks should be excessive for citizens. He said right now he’d probably vote against the ballot measure, but added that he could change his mind after learning more about it. Henderson resident Winnie Roybal, 69, a Clark County School District retiree, said background checks are needed. Bendixen & Amandi, based in Miami, has done projects for clients including The Washington Post, Hillary Clinton’s 2008 presidential campaign and Barack Obama’s 2008 and 2012 presidential campaigns.